Here on Gabriola Island, we’ve been deep in fog for much of the past week – weather which can dramatically shift my sense of solid ground. When all landmarks beyond those immediately in front of me disappear, along with the horizon, it can feel like being aboard a ship on the open sea. Fortunately, I welcome the fog – so long as I’m on dry land rather than in an actual boat, where fog can make for major stress (see here and here for examples). This week’s weather has been perfect for photography: bright, diffused light that allows for fast enough shutter speeds to leave the tripod at home, with none of the glare that sunny days bring. Gabriola Passage in the fog. Valdes Island, just across the pass, is obscured. A tiny bit of Rogers Reef and its marker, to the left, are just (barely) visible offshore. Not a day for boating. Sandstone ledges and the reef marker, just offshore. Breakwater Island is out there somewhere, beyond the birds. No view from Drumbeg’s benches today! A reminder: no matter what the weather, if you’re on Gabriola Island I hope you’ll drop by to see my new photography show, “Afloat in the Salish Sea: Images of Gabriola”. It’s downstairs at the Community Health Centre (691 Church St.), open Mondays through Fridays, 8:30 am to noon. Final day to see it will be April 2. 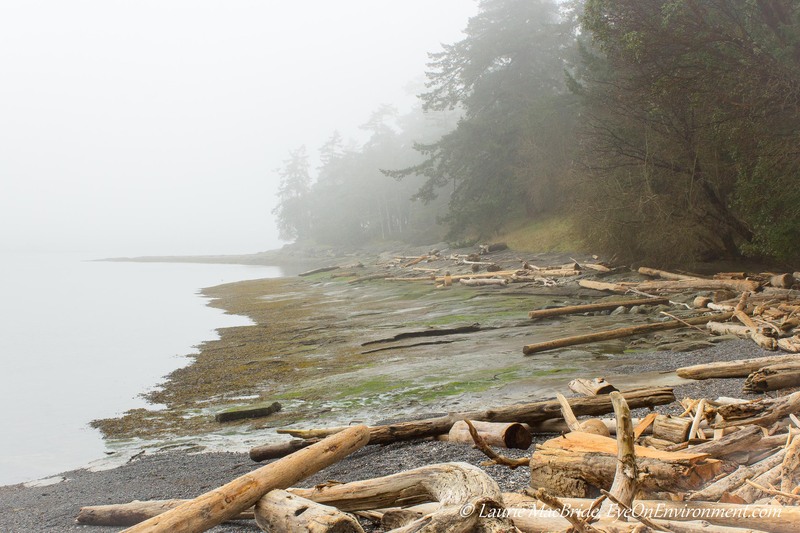 Posted by Laurie MacBride, Eye on Environment on March 11, 2015 in BC coast, Gulf Islands and tagged beaches, Drumbeg Park, fog, Gabriola, nature, photography, photos, places, shoreline, weather. Wow, Laurie, what amazing captures here, totally quintessential west coast landscapes, no doubt about it! Thanks so much,, Toad! I do love the sense of mystery that fog brings – everything is so much more subtle and ethereal. What a beautiful place and so lovingly captured in the fog! Thanks, Sherry! It’s one of my favorite places to walk. Of course, it helps that it’s very close to where we live! I am glad to see you are able to use the weather conditions to get some really gorgeous shots.